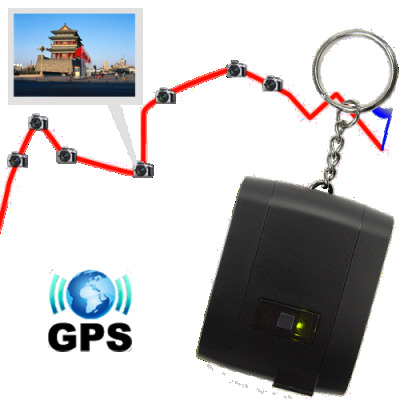 Successfully Added GPS Receiver + Data Logger + Photo Tagger (Keychain Edition) to your Shopping Cart. GPS Receiver + Data Logger + Photo Tagger (Keychain Edition). A flexible GPS device that conveniently combines a receiver, data logger and photo tagger on a handy keychain for maximum portability and functionality. The onboard GPS Receiver will search for a GPS signal, accurately finding and plotting your precise position. Connecting via wireless Bluetooth, this GPS Receiver pairs with your notebook/laptop, Mobile Internet Device, PDA or smartphone with the appropriate GPS map software to view your current location. For those who drive and travel a lot, whether for business or pleasure, then they will benefit from the GPS Logger's ability to log detailed GPS travel information, including exact position, date and time, routes traveled along with speed and altitude. Simply connect the GPS Dongle to your PC using the USB port and start the included software package. View all of the routes logged at your leisure using Google Maps or Google Earth, even down to street level - it's that simple! The flexible software is user-friendly, enabling you to review precise journey data such as start time and end time, duration and distance along with other GPS information. With its on-board memory, this lightweight dongle will comfortably record and store a large amount of travel data. This GPS logging function would be ideal for those who jog, travel by car, cycle, or travel a lot. Phototagging is the latest trend and the CVHN-G49 GPS Dongle does this in style! This unit will let you superimpose your photographs onto the included map software, showing the photos taken at each location. Simply embed the GPS information into the pictures and upload to the popular Flickr website. Perfect for sharing your latest adventure, vacation or just outdoor trip, with friends and family! This a great way to show off and keep in touch with everyone. Other suitable uses for this great GPS device include asset protection, security personnel, field workers, distributors, long haul firms, supply chain personnel, general route mapping and keeping track of children or pets. This is a great, user-friendly 3-in-1 product designed to accurately track and record the movement of people and vehicles to ensure safety, plan routes or simply to monitor logistics. So click "Add to Cart" now to instantly place this item in your shopping cart. Do not pass up the opportunity to see just how useful this GPS Receiver + Data Logger + Photo Tagger really is! This model portable GPS Receiver + Data Logger + Photo Tagger includes excellent user-friendly software for the data logger and photo tagger functions. In addition, it is compatible with all major brands of GPS computer software, however this model does not come with any GPS navigation map software. Software languages: English, French, German, Dutch, Italian, Portuguese, Russian, Spanish, Thai, Japanese, Simplified Chinese, Traditional Chinese. GPS data logger and photo tagger functions requires only this device and the free included sotware: no subscriptions, no fees! The software supplied is designed to be user-friendly for everyone to use. Whether you are phototagging or planning routes, the software is designed to be easy to use and provides you with great results. One amazing gadget for tracing your travel route on Googlemap. Tag points of interest and photos. It plays back the route travelled on the map! I have already this device for 2 weeks and I'm really very satisfied. I use it mainly as GPS bluetooth positioning system with my Nokia E63. It works really great with GoogleMaps as well as with the Nokia Maps Software. When I tried to use it with my computer (WinXP) for data logger goals, I had some however issues. After the installation of the software, this one seemed not to be able to communicate with the GPS device: sth with data writing. All has been settle by updating the updated driver: I went on the website of Silicon Labs and downloaded the last version of the driver (v.6.1). Now everything works fine. In case, you encounter the same issue, you can find the updated driver at the following web page : http://www.silabs.com/products/mcu/pages/usbtouartbridgevcpdrivers.aspx. Really a great product and for an amazing price! on 2009-06-05 03:34:58 Nice piece of GPS services!